Today is the sixth annual Fountain Pen Day! It was established in 2012 ‘to help embrace, promote, and share the use of fountain pens in day-to-day life, as well to help revive handwriting as a whole’. I’m celebrating with a giveaway with Pen Chalet. 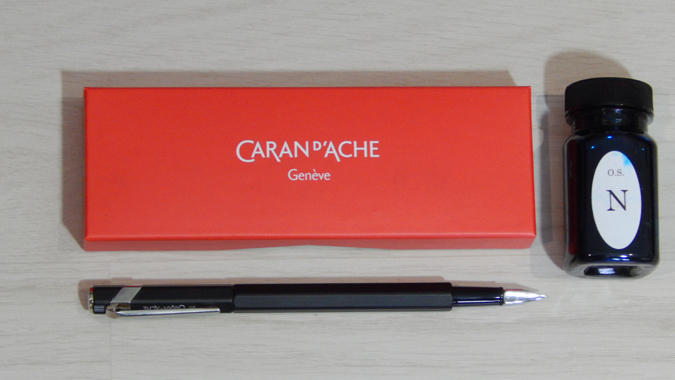 You could win a Caran d’Ache 849 fountain pen (check out the fab range of colours on their site) and a bottle of Organics Studio Nitrogen Royal Blue ink (also available in some pretty epic colours). To be in with a chance of winning, just complete the Gleam entries below. Terms and conditions: UK entries only. The giveaway will close at midnight on Thursday 9 November and a winner will be drawn at random. The winner will be contacted directly and if they don’t respond within a week a new winner will be drawn. Be sure to follow #FountainPenDay for more offers and giveaways. I absolutely love stationery, especially new stationery. It gives me a sense of new beginnings, hope and infinite potential. I also have a love of notebooks and planners. There is something so enticing about a new notebook. A blank page to be filled with dreams, aspirations and plans. It’s a safe place where my ideas are welcomed and encouraged. I am obsessed with notebooks. I have a top wardrobe shelf filed as in a library with varying sizes, colours and an index depicting subjects within. !! !